Everything is one of my all-times favourites, an absolutely indispensable program which I use daily. It satisfies my needs for lightning-fast search, yet I appreciate newcomers like CSearcher for example-it is always better to have alternatives. Such a brand new alternative is WizFile which first public release came out on 2018-04-09. WizFile is a very fast file search utility that can find files on your hard drive almost instantly. The entire file system can be quickly sorted by name, size or date. 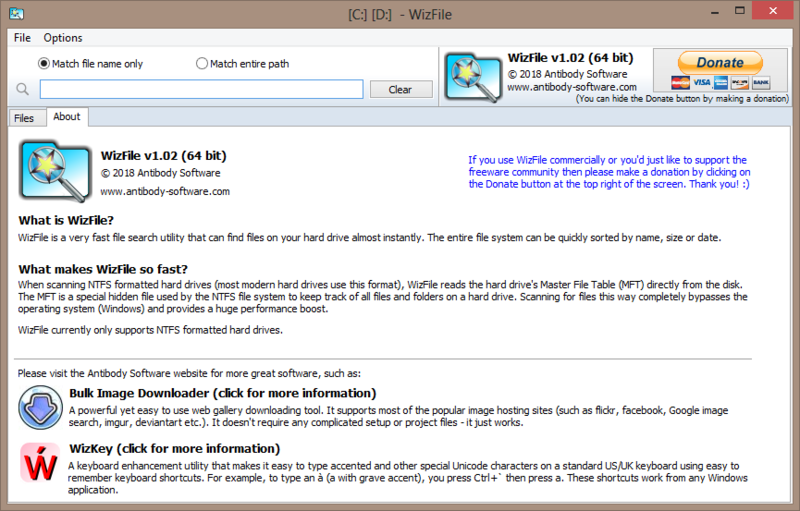 WizFile currently only supports NTFS formatted hard drives but support for other hard drive types is planned. When scanning NTFS formatted hard drives (most modern hard drives use this format), WizFile reads the hard drive's Master File Table (MFT) directly from the disk. The MFT is a special hidden file used by the NTFS file system to keep track of all files and folders on a hard drive. Scanning for files this way completely bypasses the operating system (Windows) and provides a huge performance boost. 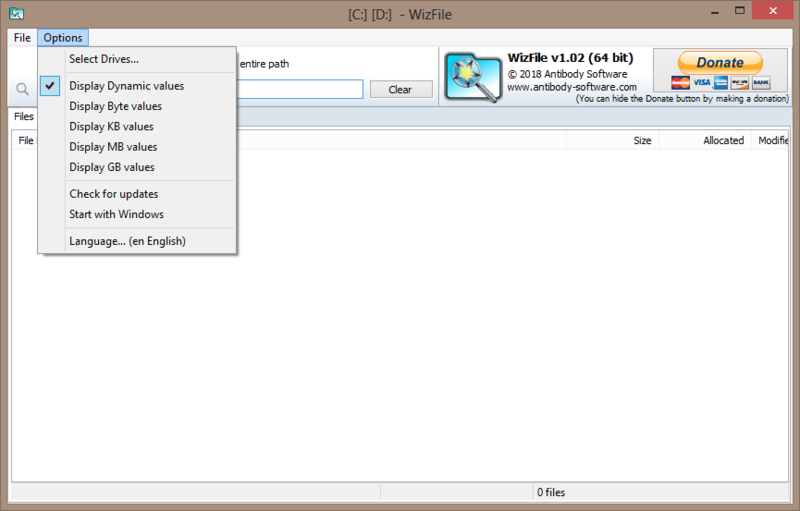 WizFile has native portable version- settings file (WizFile.ini) is saved in program folder. WizFile is released as DONATIONWARE. It may not be resold. WizFile was created by Antibody Software, the developer who also published WizTree (which is in the database and has been discussed in the forum). If the user donates to WizFile they will get a unique supporter code plus instructions how to use it and remove "Donate" button from WizFile. I tested the x64 version of WizFile and although it worked fine (no crashes, no errors) I noticed it was using too much memory for a program of this kind- on my x64 system WizFile used about 360 MB of RAM. I do not know whether this is a memory leak but I hope that the developer will be able to slim down the memory usage (I have already contacted him about that). Just using a lot of memory doesn't mean its a memory leak. That's not what a memory leak is. From what I tested, it seems like it just seems the amount of memory it uses depends on the number of files it scans. If I deselect all my drives from being scanned then it shrinks to about 100MB usage. If I select only My C Drive then its 160MB. All drives selected it uses about 620MB. Deselect all of them again then it shrinks back down to 100MB. So not a memory leak at all. As what its bullet point feature states "Does not require a separate database file - all file data is kept in memory". Unlike Everything which writes an actual database file to remember recently scanned files. WizFile scans fast enough to not need a database file. But of course thats at the expense of more memory usage. Sometimes using more memory means the application can perform better. I think Everything is all around still better at um everything... It just has way more options. WizFile is pretty simple and barebones but it gets the job done fast. I think simplicity is what its going for. If you're using Windows 10, I wouldn't worry too much about memory usage. It's a tad bit better at managing memory compared to previous OS versions. I was short of time and my test was superficial. I also somehow missed that WizFile "Does not require a separate database file - all file data is kept in memory". The 32 bit version uses a lot less memory than the 64 bit version (due to pointers being 8 bytes in size on 64 bit Windows and only 4 bytes in size on 32 bit Windows). 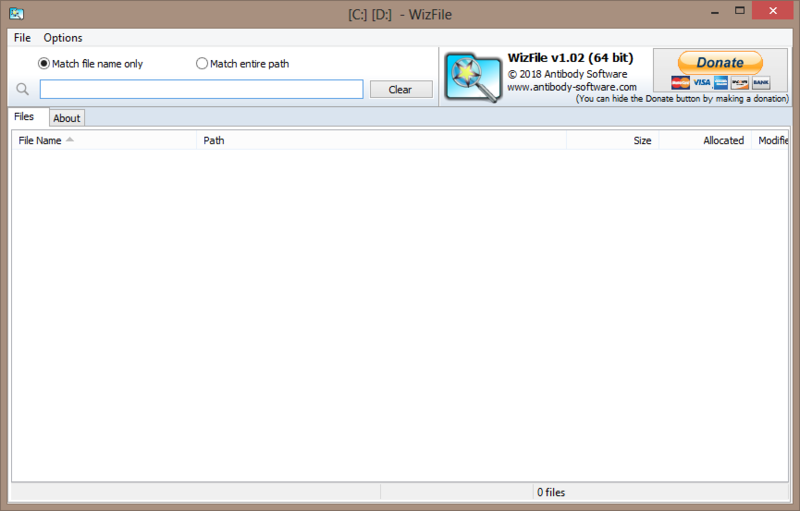 The 32 bit WizFile.exe will launch the 64 bit version if it detects WizFile64.exe in the same folder. 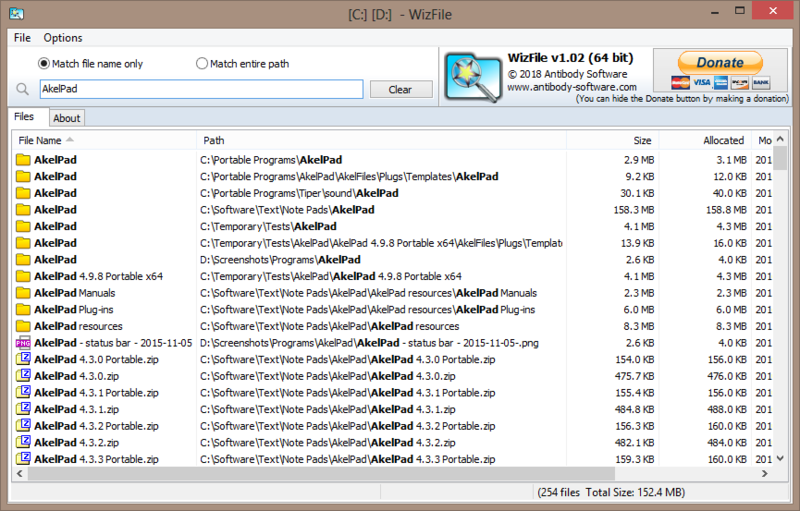 If you use the portable version remove WizFile64.exe from the folder to only use the 32 bit version. I tested the x32 version and it is really slimmer on memory usage- on my Windows 8 system it used about 100 MB less than the x64 version. Try starting the program with no drives selected. both x32 and x64 gives me 5.4MB memory usage. Then add drives to scan while its running. I added Drive C and both x32 and x64 increase the same amount of 138MB. Oddly not much of a difference on my end. Either way, the memory usage is actually small by itself. The database size is the what determines the large chunk of memory used. In fact currently my main machine has 16 GB of RAM and rarely more than 25% is being used. Since I initially missed out the fact that the program was not using a database I was surprised by the resource usage, that is all. The developer mentioned that he would try to limit memory usage in the next release. As far as I know version 1.02 was the first public release and I suppose that more polished versions would follow. I gave this a try and I like it as an alternative to Everything, I'd rather it use memory over I/O'ing a DB file, so that's a plus in my book. I wish there was a way to blacklist a folder or two though, like have it ignore the C:\Windows\ folder, as I don't need to be searching in there for general purpose things, so having it ignore that unless asked to would result in cleaner and faster searches, that'd be my number one feature request for this. Also it seems a little buggy, window positions don't save correctly on multi-monitor setups, and I think the .ini files even gets bugged/corrupted too when windows get saved in weird ways, requiring a delete to start fresh, also some DPI issues I've seen as well. There is also little things like how closing the program just puts it on your taskbar instead of you know... closing the program, if I wanted to hide it, I'd minimize it. Buts I'm sure these things will get worked out eventually, it's the initial release after all. I can confirm that memory usage is considerably reduced indeed- on my system the x64 version uses about 133 MB of RAM max. "schtasks /Delete /TN WizFile /F"
Hi - I'm the author of WizFile. 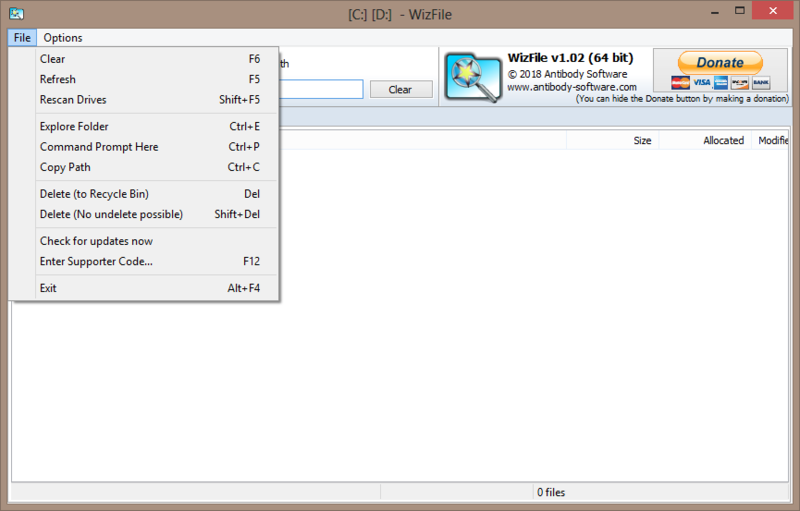 If you enable the "Start with Windows" option WizFile will update the task scheduler to start WizFile when you log in. It's done this way so that it can start without the Windows UAC prompt appearing. What you're seeing above is WizFile removing itself from the task scheduler. It does this when it starts up if the "start with windows" option is off just to make sure it's not still enabled in the task scheduler. Welcome to the forums and thanks for the background. Another new user. Thanks for the post and welcome to the forums. Heya, thanks for the reply, sorry mines a bit late but this site likes to log me out constantly and I just couldn't find the time. Anyway what WizFile does here is something I find quite annoying requiring certain permissions to run because of it, it would make more sense to run this command only if you changed options from "start with windows" -> "not start with windows", but at every time seems kinda pointless, and like I said because of this depending on security setup, rules need to be permitted here just for a simple search.